Gardeners treasure the chance to get outdoors and work with plants. They feel the rhythms of the seasons. They’re in tune with nature and want to make their corner of the world a better place. Earth Day is coming up this Sunday, April 22, so this seems like a good time to review ways we gardeners can be more effective in helping the environment. Many of the tips on our list today are things we’ve talked about in previous articles, but perhaps today is the day you try something new. Even if you already put these suggestions into practice in your garden, it’s always good to get a reminder to help reinforce those good habits. Here are six ways gardeners in the Buffalo area can help out Mother Nature. Just because something is labelled organic doesn’t mean it’s harmless. In a previous article, Dr. Fran Evans, a master gardener and retired chemist, told us that organic isn’t always the best choice for fertilizers and pesticides. Whichever product you choose, “Know what you’re using, know how to use it, and know the consequences,” he said. An example of an organic product that must be used with care is Garlic Fire Spray. We gave you the recipe— It uses simple ingredients and you can mix it up in your own kitchen. It kills ants, aphids, caterpillars, grubs, scale and mealy bugs, and can be used to deter deer and rabbits. However, don’t get the impression that you can apply it with a fire hose. Even though you make it yourself, you still have to be selective in using it. It kills just about anything small, including beneficial insects such as lacewings and ladybugs! The number one pollution problem for the Great Lakes is a threat gardeners can do something about– sewage runoff. “Four billion gallons of raw sewage winds up in the Niagara River every year,” said Larry Brooks, watershed restoration project manager for Buffalo Niagara Riverkeeper. To understand why, see the diagram and read more here. Gardeners can help by keeping rain water out of the sewage system. 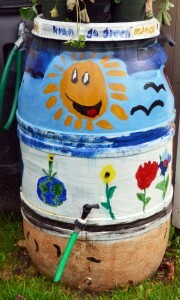 One way to do that is by using rain barrels. Not only do rain barrels help the environment, they can provide a convenient source of water in parts of your garden where a hose can’t reach. Remember that a rain barrel can catch water running off the roof of a shed or garage, too. Plus, you can save $34 on water during peak summer months by using a rain barrel. Another way to help keep rain water out of the sewage system is by directing it into a rain garden. A rain garden is basically a shallow depression designed to collect and soak up rain and snowmelt from roofs, sidewalks, driveways and lawns. A rain garden allows up to 30 percent more water to soak into the ground than a typical patch of lawn, according to Buffalo Niagara Riverkeepers. The idea is to soak up the rainfall so the rain doesn’t overwhelm the sewer system. To do it right and maximize the water you retain in your rain garden, you have to do some calculations and planning. Find out more here. Native plants provide a habitat for butterflies, insects, hummingbirds and other small birds and animals we know and need. Native plants are also vigorous and hardy. They don’t put a strain on our environment because once they’re established, they don’t require watering or fertilization. That makes native plants a good choice if you’re looking for a low-maintenence garden, too. Native plants can be pretty additions to your garden. 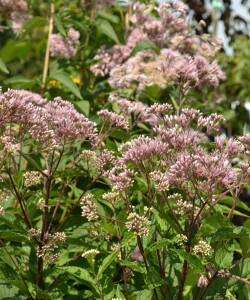 The Joe Pye Weed at left demonstrates that native plants can be easy on the eyes as well as easy on the environment. 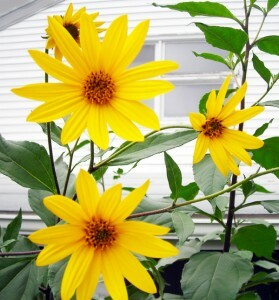 The sunchoke or Jerusalem artichoke, seen at the beginning of this article, is another cool native plant. Here is a list of native plants, and here are native plants for native plants for rain gardens. Great soil is the basis for a good garden, and there’s nothing like compost to give you great soil. It’s easy to make your own compost. Throw leaves and kitchen scraps into an old garbage can. Wait. Eventually, you’ll have compost. Here you can find a list of items you can use in a compost pile (as well as some things your shouldn’t throw in there). Check out tips on how to speed up your compost pile. 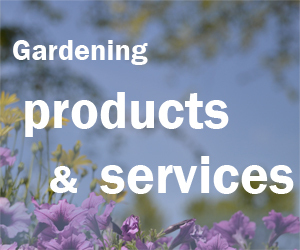 There are lots of ways to learn more about the environment of your garden and ecology in general. Read helpful articles. Last year, Mike Van Der Puy, a retired research chemist, offered ways that we gardeners can work in harmony with Earth’s natural systems. 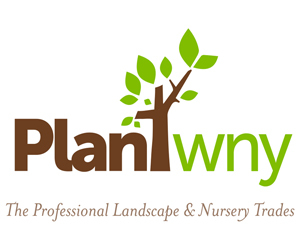 More recently, he discussed how gardeners can deal with Western New York’s changing climate. You can attend classes, workshops, seminars and other events throughout the year. Our Upcoming Events Page lists an amazing array of activities. One example is the sixth annual Buffalo Enviro-Fair to be held from 11 a.m. to 2 p.m. Friday, April 20. Booths from area eco-organizations will be set up in front of City Hall in Niagara Square, Buffalo. Re-Tree WNY, an all-volunteer not-for-profit group formed to replace trees lost in the October Storm of 2006, hosts the event. Re-Tree WNY will give out free tree seedlings and will sell reusable shopping bags to benefit Re-Tree WNY. New events are constantly being added to our Upcoming Events Page, so check back often. If you can spare a day or an afternoon, you can join with others to help the Western New York environment. Many volunteer opportunities are also included on our Upcoming Events Page. For example, now through September, you can plant trees and shrubs with Buffalo Niagara Riverkeeper. More opportunities for volunteering with environmental groups are also listed on GrowWNY, a hyperlocal source of information about living green. I’ll be presenting an Earth Day class on ‘Organic Gardening’ this coming Sunday, April, 22, 2012 from noon until 1:00 p.m. at the Feel-Rite Health Food Store, 6000 South Park Ave.
Hamburg NY, 14075, 716-649-6694. Pre-sale tickets are $5.00 [for Pre-sale ticket guests – you will receive a $5.00 coupon for purchases in the store that day]. Walk-in guests, your ticket is $8.00/no coupon. Refreshments and food will be provided by Feel-Rite Deli. Available for sale that day: Summer flowering bulbs, organic soil, soil additives, natural insecticides and pest controls, and a secret freebie. I hope to meet new gardening friends! Wonderful post, Connie, and great reminder. And David, the class sounds very interesting. Can you get tickets reserved by phone or must they be picked up at the store? It is a long drive and I was hoping to order by phone. Hello, Donna. I believe you can reserve tickets by phone. Give Brenda a call at Feel-Rite FreshMarket/Hamburg: 716-649-6694. Where would you be driving in from?